We posted last year about the dispute between the Mormon Church (The Church of Jesus Christ of Latter-day Saints) and Jewish Holocaust survivors who complained that the LDS were posthumously baptizing Holocaust victims in their temples. Now comes the word that Jewish and Mormon Church leaders have come to an agreement over this issue. 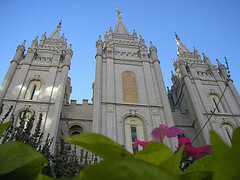 Leaders of the Mormon Church will now require church members to have a family relationship with any Holocaust victims that they baptize by proxy in the Temple. This prevents the mass submissions of Holocaust names for temple baptism that had occurred in the past which offended Jewish groups particularly Holocaust survivors and their families. « -Remembering 9/11/01: How Should We Respond?